Ryan Switzer, WR/PR, North Carolina (5'10, 185): North Carolina at (16) Miami, 3:30 p.m.
Switzer also had two punt return touchdowns called back over his career. Assuming North Carolina makes a bowl game, Switzer is on pace for 100+ catches and 1200+ yards. Darren Sproles said this offseason that he believes 2017 will be his last year in the NFL. Switzer could be a guy who takes over for Sproles as the team's primary punt returner, while also providing more depth at receiver. Joshua Dobbs, QB, Tennessee (6'3, 210): (1) Alabama at (9) Tennessee, 3:30 p.m. The Eagles currently keep just two quarterbacks on their active roster, as roughly half the NFL does. Before they traded Sam Bradford, they would have kept three. Aaron Murray is the Eagles' third quarterback, although he resides on the practice squad. However, Eagles owner Jeffrey Lurie clearly stated that the Birds are looking to draft a quarterback in most years going forward. "We’re still looking for a third quarterback, somewhere in the draft, like we used to do," said Lurie at the NFL owner's meetings back in March, before the Eagles drafted Wentz. "We would always, each year, or every other year, try to draft a quarterback. At some point, that’ll probably continue as long as there’s quality throughout the draft, and you can identify how you want to develop a quarterback over time. It’s not somebody who has to step in (immediately), then hopefully we can find somebody throughout the draft." As a passer, Dobbs has a good arm and can be accurate when he's able to step into his throws, but he tends to lose that accuracy and can make bad decisions when he's forced to move. Also, he can be over-reliant on his running ability, as he'll often bail from the pocket at the first sign of pressure. Still, his physical traits could make for an intriguing project in the later rounds for an Eagles coaching staff that is absolutely loaded up with quarterback gurus. Dobbs is a senior, so there's a pretty good bet he'll get an invite to compete at the Senior Bowl in January. 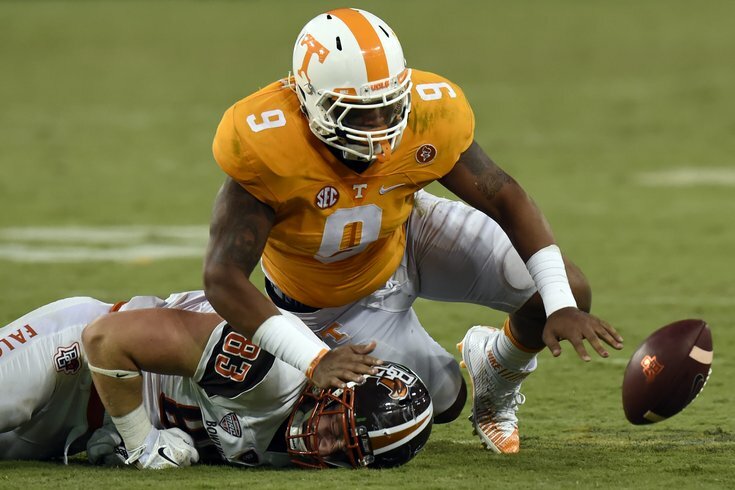 Derek Barnett, DE, Tennessee (6'3, 265): (1) Alabama at (9) Tennessee, 3:30 p.m.
Barnett is likely to be a first-round pick. The Eagles' defensive line is the strongest unit on the team, so why would they use a first round pick on another defensive end? Well, the defensive line's ability to get to the quarterback while only rushing four sets up everything else for the defense to succeed on the back end. In my view, you can never have enough talented pass rushers, especially when you're that reliant on their production up front. Cam Robinson, OT, Alabama (6'6, 310): (1) Alabama at (9) Tennessee, 3:30 p.m.
And the above list is incomplete. There were more players he blocked who have been drafted, but the above players are just the Day 1 and Day 2 picks. Throughout Robinson's college career, there has been a new stud pass rusher that he has had to face every single week. To note, Robinson may not have necessarily blocked all of those players for the entirety of the game when he faced them, but as the LT, for the majority of the above, he did. That list doesn't include guys like Texas A&M likely top five pick Miles Garrett, LSU's Arden Key, Arkansas' Diatrich Wise, Auburn's Carl Lawson, and Tennessee's Derek Barnett, all of whom Robinson will face (or already faced) this year. It also doesn't include the multitude of stud Alabama pass rushers he faces every day in practice, like Jonathan Allen, Tim Williams, and Ryan Anderson. There won't be a more battle-tested offensive line prospect than Robinson coming of college this year, assuming he declares for the draft. You can see Robinson's dominance in the run game, which is clearly his strength. Robinson is easily a first round talent, and based solely on his play on the field, he's highly unlikely to slip to wherever the Vikings' first round pick owned by the Eagles falls. The only way he'll slip will be due to off-the-field concerns. In May, Robinson was arrested for possession of marijuana and a stolen firearm. The latter was a felony charge, which was later dropped along with all other charges. The Eagles' need for an offensive tackle could be dependent on the play of rookie fifth-round pick Halapoulivaati Vaitai over the next 10 games while Lane Johnson serves his suspension. Raekwon McMillan, ILB, Ohio State (6'2, 240): (2) Ohio State at (8) Wisconsin, 8:00 p.m.
With Nigel Bradham's off-the-field risks, Mychal Kendricks' poor play, Jordan Hicks' durability concerns, and Stephen Tulloch's age, the Eagles could certainly use a stable, long-term presence in the middle of their defense. McMillan has good size at 6'2, 240, and led the Buckeyes a year ago with 119 tackles. He also leads Ohio State in tackles so far this season with 33. McMillan reminds me a little of DeMeco Ryans, in that he's very good at taking on blockers and stuffing ball carriers in their tracks, although there may be times when he'll struggle in space at the next level, as he does not possess high-end athleticism. That comparison isn't to be confused with "late career DeMeco Ryans," who was a liability in the passing game. McMillan should be adept enough in coverage in the NFL to be a three-down starting linebacker. Drafting a player like this could prompt Hicks to move outside, which could add to the longevity of his career.